To borrow a phrase from Dr. Who? Our quest is to grow more of our own food this year. Last year we only produced 215 pounds. With the volatile weather, it is getting harder. The rhubarb did not produce well this year. We are getting about 3/4 of a pound a week. The deer and robins ate all the strawberries. Entire plants are gone. The peach tree died. Of the seeds I got from Baker's Creek, most were a crop failure. So no ground cherries or alpine strawberries. It's a high price for poor germination. We are looking at a lot of potatoes to supply our calories this year. If they survive, there should be watermelon, squash and pumpkin to provide calories as well. The wet weather is making them struggle. By planting a lot of varieties, I am hoping for something that actually likes our weather. All of the plants from the Co-op's Plant Something sale died. They were root-bound. So majoram, lime thyme, hyssop, and sage seriously struggled and most died. All herbs from the Phipps plant sale survived. Timing plays a role as well. The Phipps sale was much earlier than the Co-op's. Despite the long cool spring, when the growing season started, everything needed to go in right away. The night of April 29-30th, it went down to 29° F.
Today was hot and not condusive to gardening. The potted plants were watered and several of the seedlings planted. 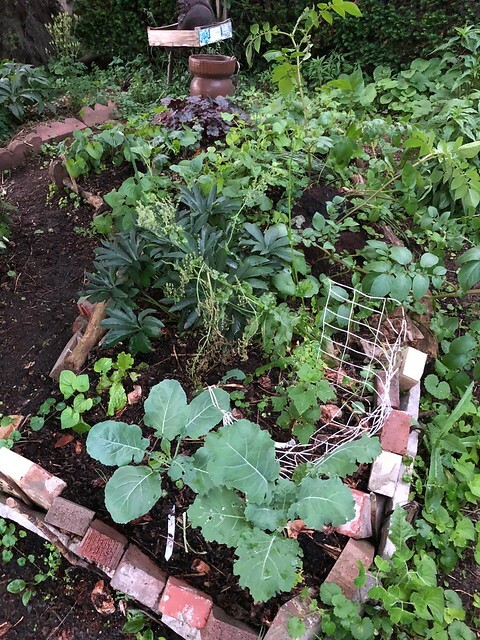 Collards, Russian Kale, Spanish yellow onions, and Lacinato Kale went into the kuiper belt. The previous transplants appear to love it there so I populated it with more. The bay laurel got transplanted into a large container. I took the other tomato starts and moved the pots to where they'll live soon in middle earth. I wanted to wait until rain is forcast before transplanting them. The bookcase garden is very wet and causing a swamp just below it. Never had that much water on the hill. The grass turned black. The birds have fledged their nests. One chick died on my steps, making a squishy mess. Since a cowbird put its egg in with the robin's, it could have been their second chick. I don't like cowbirds. Lazy, mean, oppurtunists! The garden is this way too. This year, creeping charlie is the oppurtunist, taking over everything. I feel that whatever edibles I planted survive this fledging time, they will do really well. If they struggle, then there is one less robin. That is why diversity is so important. The more diverse the food supply, the more likely something will survive and thrive. So there may not be strawberries but there will be kale. Three more grow bags got planted with nine potatoes in total. Rose petals were harvested for winemaking. It took me forever to find the recipe. I last made it in 1992. That got me thinking about racking last year's wine, which I did in the blissfully cool basement. I need to clarify these and bottle soon. 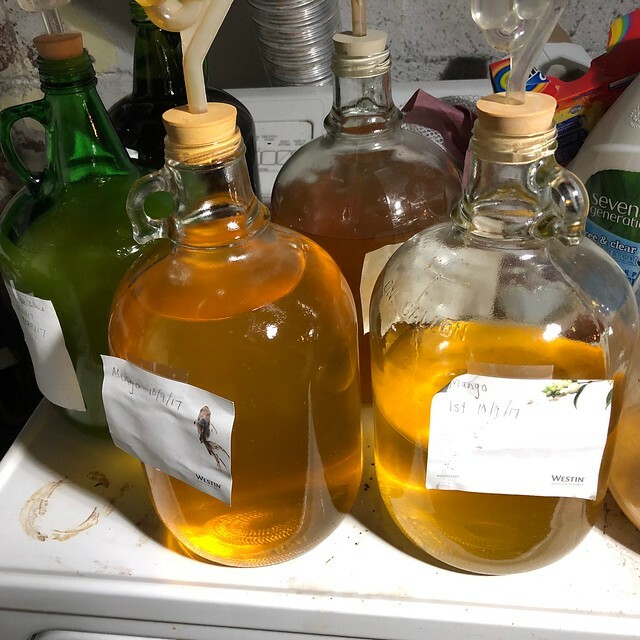 Thinking about picking honeysuckle flowers again for mead this year. More plants need homes in the garden. There is never enough space. My goal every year is to get everything in the ground by June 1st. We've had frosts as late as June 2nd before, but you never know what kind of year you'll get. Another year, the last frost was in February. Ten items got added to etsy today. Ten yesterday as well. If pictures are taken before 9 am, the light isn't too bad. As I unpack the van, I am putting everything I can online. If you have seen us carry something but don't see it now, contact me. I'll try to get it up sooner. Today was hot, humid and horrible. I'm emptying the dehumidifier twice a day. That's a lot for us.